Side Eyes, Black Faces, White Privilege At Winchester U. When legendary psychiatrist, journalist and Algerian Liberation figure Frantz Fanon's "Black Skin, White Masks" (published in 1952 just nine years before his death at 36) arrived, his book caused an awakening and a stir. Mr. Fanon spared no quarter in a ruthless, deeply thought-provoking and incisive book on blacks, whites, race, identity, colonialism and its effects. It was, and still is, a must-read book. Mr. Fanon's "Masks" (he also wrote "The Wretched Of The Earth") could easily be a template for Justin Simien's debut film "Dear White People", a dead-on, truthful and finely-tuned assessment of the 21st century relationship between and among blacks and whites, and more pertinently, the role identity and self-identity plays among groups of different people. Imbued by 1980s pop cultural homages, Mr. Simien's comedy-drama is a satirical exploration of race on the fictional near all-white Winchester University campus. Told in chapters "Dear White People" consists of at least five stories. They include Lionel (Tyler James Williams), whose sexual identity on a white, heterosexual campus isolates him; activist leader Sam White (a Tawana Brawley-Lisa Bonet lookalike), whose daily campus radio show Dear White People is a clarion call on race and racism at Winchester; and the school dean's (Dennis Haysbert) upper-crust son Troy (Brandon P. Bell), whose white girlfriend is the daughter of Winchester's president. Factions on the Winchester campus are balkanized and begin disintegrating as understanding and misunderstanding collide, culminating in a Halloween off-campus house party that is a racist free-for-all of blackface minstrelsy. It is worth staying for the film's end credits. Throughout, Mr. Simien, who wrote the film (he's also written a same-titled book) withholds judgment about his diverse characters, whose manhood, racial identities and ideas of beauty are often subverted and tested. We all mask ourselves in society to varying degrees, and the director's characters do the same. When you see this film you may well see yourself, regardless of who you are. "Dear White People" skillfully articulates the thoughts, assumptions, unspoken language and "race-associated" behaviors between blacks and whites. This devastating film satirizes racial perception and identity in an enlightening, provocative and intelligent way. Beneath the film's benign surface is a caustic, biting and brilliant exposé on racist stereotyping, identity politics, cultural appropriation, whiteness and self-loathing, blackness and self-erasure. 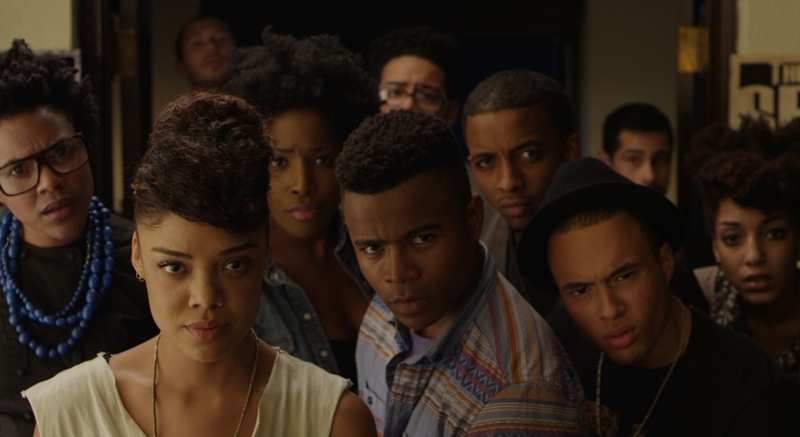 "Dear White People" accurately gauges the pulse of America 2014 and shatters any foolish myth of a post-racial society. Some of the film is literally ripped from the headlines. Mr. Simien's film isn't what some white moviegoers may fear or forecast going in, and yet, it is sad to even utter these words: the advice here is, fear not. The film's light, fresh, airy aesthetic is carefully designed. Winchester is a pristine, squeaky clean institution but its denizens sully its vaunted status. White and black alike at Winchester have contradictions that are embraced as much as they are readily exposed. The reveals of characters emerge in a sensitive, humane way. Mr. Simien tackles racial identity and masking issues as the springboard for a larger conversation. Watching "Dear White People" is a funny, appealing, intense and thoroughly enriching experience. It's an important, timely film for everyone, and it must be seen. "Dear White People" owes its influences to several directors including Robert Altman and Spike Lee (whose films "School Daze" and "Bamboozled" come to mind.) If this film indicts at all, the target is the long, American cultural "entertainment" tradition of blackface as reflected in decades of films ("Birth Of A Nation", "Swing Time", "Holiday Inn", etc), television and radio series ("Amos 'N Andy", etc. ), cartoons (Bugs Bunny, Daffy Duck, and more), celebrities (Fred Astaire, Lillian Gish, Bing Crosby, Al Jolson, Eddie Cantor, Julianne Hough, Claudia Schiffer, Ted Danson.) and more than a few everyday white Americans. There's a skewering of the disrespect by some whites of America's only black president, something which would make for a good election campaign commercial for Democrats in two weeks -- though they'd be too afraid to use it. There's a love-hate repulsion-attraction dynamic in "Dear White People". Some want to be black while purportedly hating blacks. Others want to be white while being cool to them. There's a take-down of false equivalency by the fortified Sam, who critiques racism in one solid scene. Lest some whites worry about the mere title "Dear White People", it is helpful to point out in context that forever now a whole English language constantly paints the term "black" as bad or negative on an everyday basis: "black ball", "blacklisted", "black market", "black sheep", "black day", "black ice", "black mark", "black eye". Mr. Simien's film is a group of academic dialogues, mathematical in their presentation and content rather than visceral ("Bamboozled"). The film feels instructional yet it never condescends to its audience. Its final act carries a psychological punch that penetrates. Arguably the best and most effective part of "Dear White People" is several scenes related to corporate profiteering on minstrelsy. This particular subplot is relevant to the sensationalized Fox News/reality TV era: making millions of dollars by deliberately saying the most offensive, outrageous things -- uttered by conservative commentators (Bill O'Reilly, etc.) some of whom don't truly believe half of what they say on air. There's complicity across the board, and none of the characters are unscathed. Ultimately, Mr. Fanon got an obvious jump on today's Internet and 24-hour cable TV generation, whose instant communication, fear-ravaging, misinformation and bombast still don't match the calm, explosive and instructive power of what he wrote more than 60 years ago. Yet Mr. Simien, in a confident and wonderfully layered feature-directing debut, pushes all the appropriate buttons on the big screen and in your heart and mind, to greatly successful and riveting effect. Also with: Teyonah Parris, Marque Richardson, Brittany Curran, Kyle Gallner, Peter Syvertsen, Kate Gaulke, Brandon Alter, Brian Curtis James, Jemar Michael, Justin Dobies, Keith Myers, Ashley Blaine Featherson, Naomi Ko. "Dear White People" is rated R by the Motion Picture Association for language, sexual content and drug use. Its running time is one hour and 48 minutes.